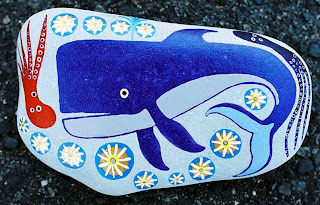 In honour of our friends in the sea, we’d like to share with you some pictures of art we’ve done in recent years which contains or is based on images of whales and dolphins. With homo sapiens, “man, the wise” embroiled in a maelstrom of seemingly irreconcilable contradiction, believing himself to be ‘ascending into another dimension’ but in reality experiencing a nose-dive of consciousness, a free-fall of ‘civilization’ leading inevitably to destruction of the Earth and his own self-extinction, now more than ever the whales and dolphins qualify as the ‘real people’ of this planet. They were here long before us, and will surely endure beyond the “anthroclastic”, or “man-breaking” era…but not without a lot of pain and suffering. The cetaceans have been here on the order of 30 million years, returning to the sea after aeons of life on land, possibly so that they might evolve beyond the limitations imposed by a strictly terrestrial existence, with its greater extremes and instabilities of weather and climate, increased gravitational pull, periodic cosmic catastrophes punctuating the slow motion of geological time, and perhaps most importantly, the constant energetic bombardment of the atmosphere and land by an unending stream of waves, particles and emanations from the sun, super-novae, the galactic core and unknown sources. 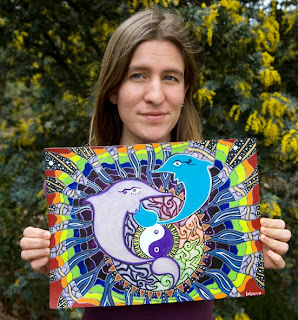 This latter cosmic factor, and the shielding afforded by living under water, could be the basis of an understanding of the ‘permanent psychic mutation’ that seems to be our biggest problem, as well as of the self-evident ‘higher consciousness’ of the cetaceans, a nebulous quality sensed by many people yet understood by no one, regardless of the claims of new-age capitalists pretending to ‘channel’ whales or of National Geographic photographers who claim to have ‘decoded’ their communications. If a trans-national accounting firm could be employed to calculate the amount of money that humans have made off the whales, not even counting from whaling, I think they would require several years of intensive work to add it all up. And how funny would it be if the researchers who recently claimed to have “decoded the dolphin language”, which is an absurd claim in itself, learned that the dolphins were saying “Our solicitors will be contacting you concerning all those unpaid royalties from the unauthorized footage of us you used in all those tv shows…” and so on? Genuine respect is not a matter of forming environmental organizations allegedly dedicated to ‘saving’ them, but is a function of creating awareness about the real threats they face from human activity, as well as stopping our own individual participation as ‘soldiers in World War 3’ through the summation of ecologically destructive activities we enact daily with no questions asked. Every time you eat the meat of an animal who didn’t volunteer to be killed, every time you purchase petrol from a trans-national oil company and drive unnecessarily in your SUV, every time you ingest the lies, infotoxin, and fake reality from television, every time you heat your brain with a mobile phone, every time you are involved in needless new construction, every time you pay taxes to a federal government…every time you engage in these activities without questioning their necessity or even existence, you are supporting and making possible the increasingly fascist military-industrial entities who are waging war on the Earth, as well as helping to wage this war, this unconscious jihad yourself…a war that’s killing not only the whales and dolphins but ourselves, and ultimately our planet…the only planet we know of who is home to life. 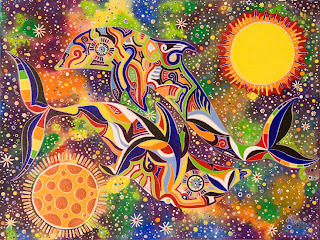 All of our art, cetacean-related or otherwise, is an expression of the creative spirit of humanity, what remains of our essential and natural ‘divinity’. Our collective and on-going misuse of creativity and intelligence has brought us to the brink of extinction on which we now stand. 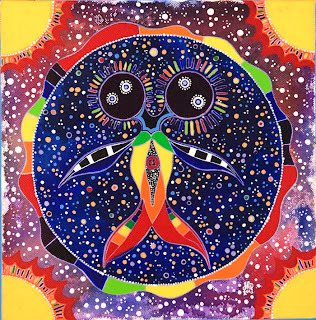 If we can regain a sense of the sacred in how we use our immense creativity, we might be able to take at least one step back from the abyss, decide if we are W.A.S.I.C.H.U. or P.O.O.H., and give ourselves one last opportunity to renavigate the human process onto a course of coherence with survival value for life as we know her. Check this link for a posting about "resolving the incoherencies" in the form of notes from my recent radio interview on "Up Over 'n Down Under"
I feel that they have been reaching out to us for aeons, waiting for their long-lost family of the land to wake up, to catch up; now more than ever they are crying out to us to stop murdering them blindly and purposefully, urging us to exorcise and reprogram our inner ‘W.A.S.I.C.H.U.’ mentality, so that we can share in the beauty, joy, ancient wisdom and real-time conscious presence that is their unique being as the true ‘elders of Earth’, their inestimable contribution to the mind of Gaia herself. 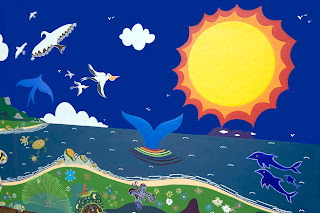 This is one of two panels done on the wall of an internet shop in Noosa, Qld, and was my first art project in Australia. 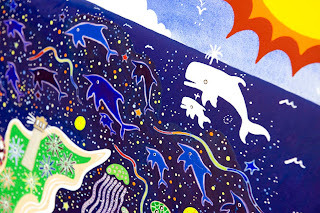 “Baiame” is an aboriginal word meaning “all-seeing sky-father” and “warrambool” means “Milky Way.” In honour of my “deep connections” with the ocean and space. A gift for our wonderful friend Peter in Darwin who has been the single biggest supporter of us and our art since we met. 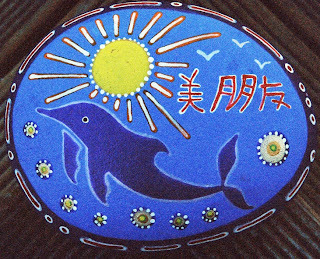 “Weffiops” is a cross between my nick-name of “Wefferson” and “tursiops” which is the genus of the bottle-nosed dolphin. 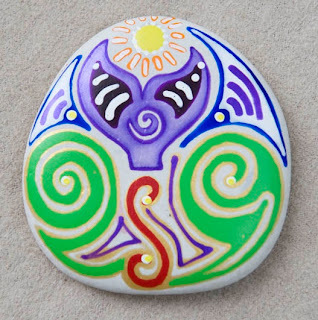 The patterns inside are called “MK-glyphs” which stands for “Mullum-Keringke”, Mullumbimby being the area inside the Wollumbin volcanic crater in northern NSW where I first painted these glyphs, and Keringke being a group of aboriginal women artists of the Arrernte tribe in the central desert with whom our art has a lot in common. 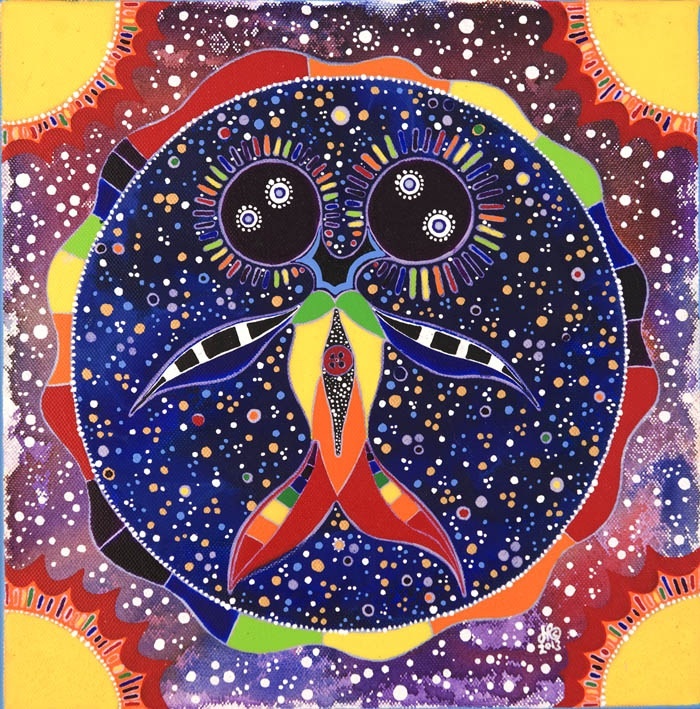 A canvas owned by my friends Jon and Michele in southern California, on the basic theme of the inner and outer realities, with a sort of galactic-membrane region which first appeared in my painting “Peyote Mitochondria” around 1995. 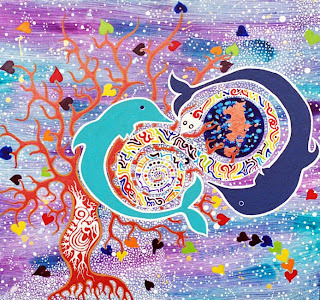 The dolphins are singing into the continuum for purposes of healing, entertainment, creative expression, and other reasons incomprehensible to humans. This large canvas was done for Rob in Tasmania. 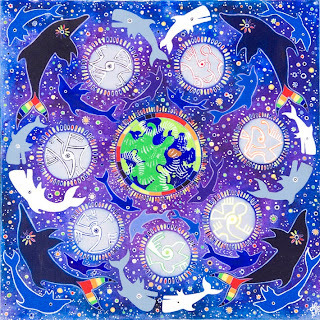 The main focus here was not what the cetaceans look like but to conceptualise visually the complexity of their various orders of information transfer. 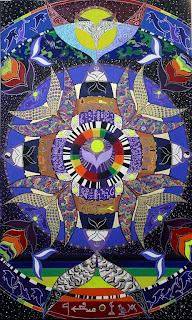 Suggestions of harmonics, fractals, cymatics and symbolic notations appear here and there. 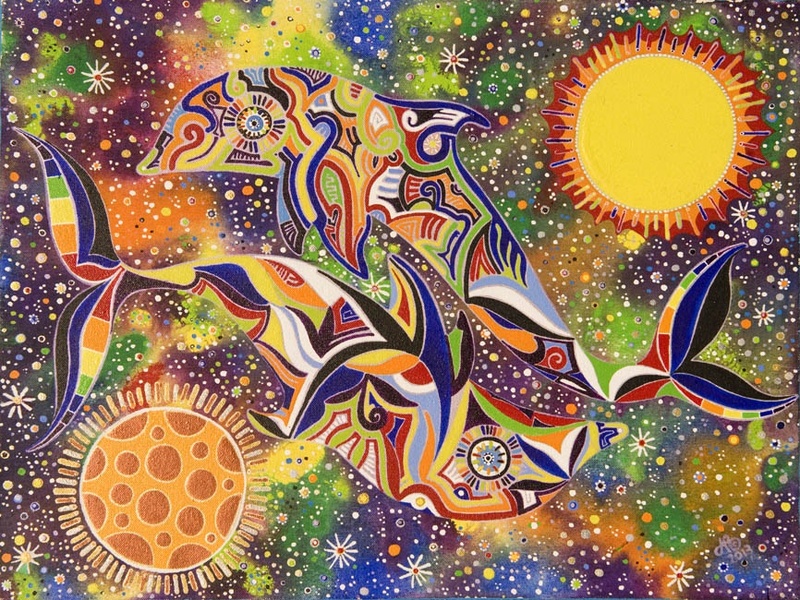 This water-colour and ink was gifted to Jim Nollman, an old acquaintance from Bay area cetacean projects in the early 1980’s. Nollman founded Interspecies Communication, an organization dedicated to understanding and ‘communicating’ with animal intelligences. 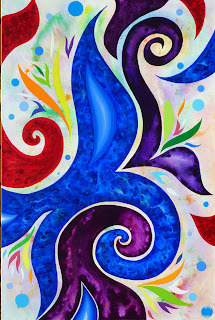 Jim donated this painting to a local school near his home in Washington state before going to work for the U.S. Navy. The first mural that Liesbet and I did together, for Martin and Ellen in WA who got us to do this 4 meter/2-panel project in honour of the fifth anniversary of their seafood restaurant. It’s held up well, being outdoors in western Australian sun, wind, sand and sea-moisture for almost five years. Humpback mothers with calves are often seen coming up the mouth of the Murchison river. 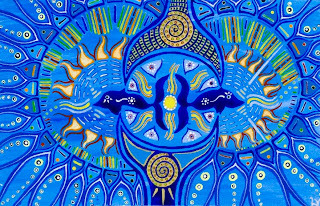 One of three panels done for John and Catherine of Lucinda, Qld, for their accommodation-café at the gate-way to Hinchinbrook Island, whose aboriginal name we used for the title. This panel represents a synthesis of landscape imagery from various areas, and honours the undisrupted wilderness and steep alpine/rain-forest environments there. 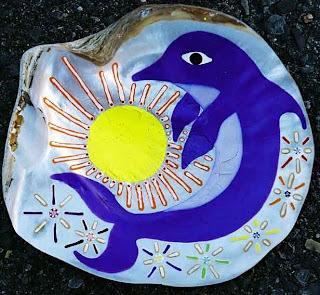 Both of these honour life in the sea, and feature real beings like the snub-nosed dolphin as well as imaginary beings like the benthic dugong, the anamorphic rainbow eel, and the barely-glimpsed soma-sting-ray. 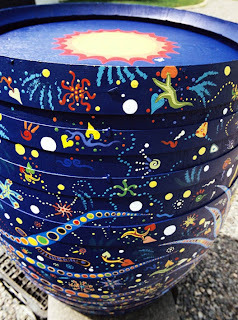 We painted the oak wine cask as a gift in honour of their support; quite labour-intensive but awesome! 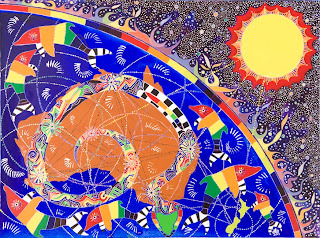 This is a detail from a 4-meter/2-panel mural done for Jay and Jackie on Flinders Island, Tasmania, in honour of the first birthday of their internet café there. 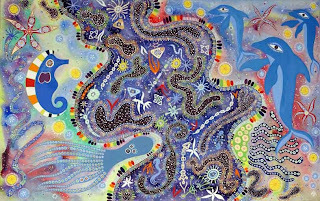 Like the Munamadany Dreaming land-scape panel, this painting synthesizes several views into one image, and is an attempt to express the ‘spirit’ of Flinders Island using pattern and colour. 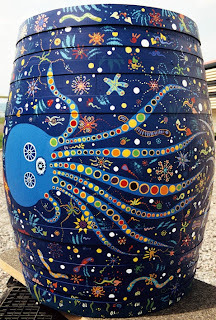 After seeing the wine cask we painted in Lucinda, Jay and Jackie asked us to paint an old 55 gallon drum, with various real and imaginary forms of sea-life. Lots of work, since painting on a curved surface is quite challenging, but it turned out fantastic, mainly due to Liesbet’s intensive efforts. A nice little painting done as a gift for our wonderful friend and brilliant travel agent Andrea in Melbourne. Thanks Andrea! 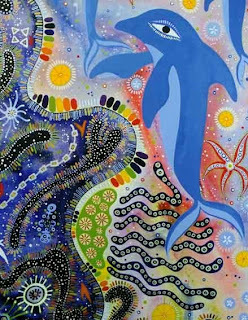 In honour not only of dolphins but also the spiral and the rainbow. 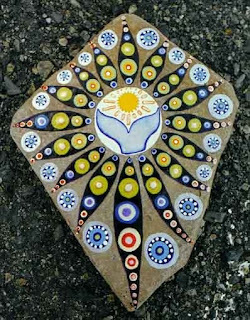 A small lovely painting Liesbet did in WA. We gave it away as a gift to someone but I can’t remember who. 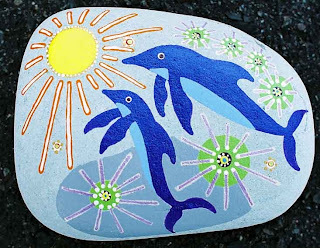 This one might be Liesbet’s very first approach to painting dolphins, except maybe on some rocks. 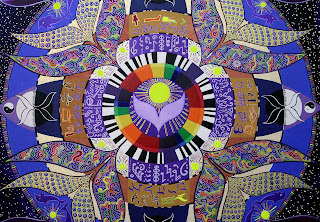 Very interesting expression of their energetic emanations. 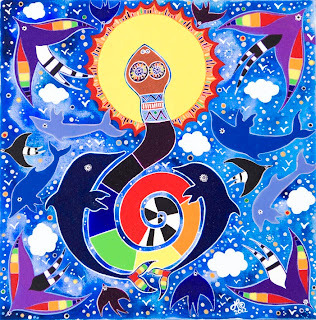 Liesbet’s dream-time vision of the ancient tree nurturing the dolphins who are giving birth to the rainbow serpent, spiralling in colour and form. Liesbet’s dream-time vision of ancient ancestors of dolphin and rainbow serpent, celebrating the sun and touching the sky with tongues of fire. The Earth is envisioned as a living cell. This painting has an interesting history. Our friends in southern California commissioned it from us so that they could donate it to Sea Shepherd’s art auction, at which it raised over $2000 for Capt. Paul Watson’s ‘environmental’ organization. Although I was already highly sceptical about much of Sea Shepherd’s activities at this time, I had yet to uncover the depth of their fraudulence. If I knew then what I know now, there’s NO WAY I would have contributed my creative efforts. 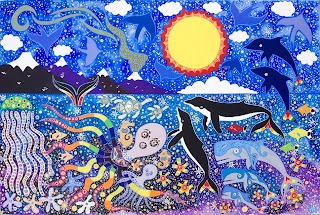 This painting, however has NOTHING to do with Sea Shepherd or any of the countless ‘save the whales’ organizations capitalizing on the public’s love of whales while failing to address the REAL threats to life in the ocean like synthetic radio-nuclides, technetronic weapons and the U.S. Navy. Sadly, Jon and Michele ‘disowned’ us as friends shortly after this because of their blind chauvinism to an obviously fraudulent Paul Watson. “Done with acrylic on water-colour paper, approx. 60 by 80 cm, this painting is a step towards a film/beyond-film project I am working on which will attempt to journey inside the minds of the whales, to help us understand and appreciate what it’s like to be them. 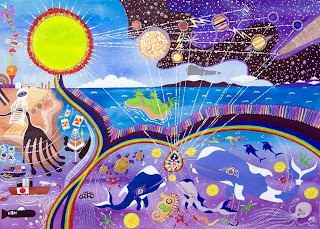 This painting illustrates three key dimensions to this understanding: their awareness of and interaction with the “cosmic context” within which life as we know it exists, here on Earth; the unity of oceanic consciousness based on sound; and the dangerous effects and side-effects of human industrial civilization which is inflicting pain and suffering on them, as well as interfering with their life-processes, of which our knowledge is minimal. 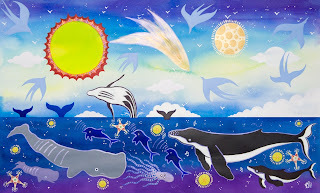 The sun, of course, is the dominant energy influence; here we see the moon, planets, a comet and the Milky Way exchanging energy/information, with each other and with the whales. Shown here also are plasma discharges, or “interplanetary lightning” between the planets, which some researchers today believe may have been the origin of human myths about “dragons and gods battling in the sky.” The cetaceans may have similar “mythologies” or even direct knowledge or understanding of these and other cosmic processes unknown to us; with their more highly advanced CNS’s, they may also possess memory capacities far beyond ours. 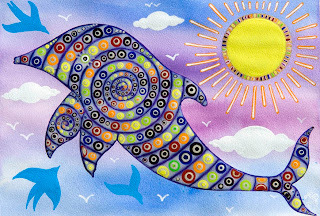 The whales may be highly aware of changes in the solar constant or fluctuations in the spectrum of wave-forms impinging on the Earth, as well as being intimate with her “heart-beat.” They may actually be able to “hear” what Kepler called “the music of the spheres” in ways that are inaudible or imperceptible to us. The ocean, particularly at any degree of depth below the surface, is essentially an acoustic environment, as light does not penetrate very far; most marine life-forms, consequently, have highly developed abilities to use sound, to “see”, to sense, and to communicate. Sound as a form of vibrational energy travels much faster and more intensely in water (higher density) than in air (lower density). Cetaceans use sound in many complex ways, none of which are directly comparable to how we use sound. They can perform stereo echo-location, to determine distance, velocity, and qualitative information about each other, other life-forms, geological features, or human artifacts; they can transmit a “shock-wave” of sound from their heads, as well, to stun fish. 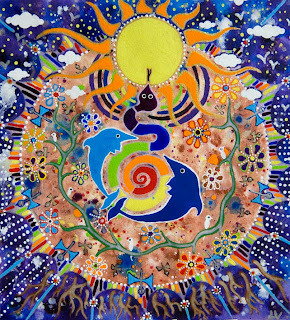 From my experience of swimming with dolphins and playing them recorded music in their own frequency-domain, I think that they “feel” sound with their whole bodies. The ancient Greeks wrote extensively about dolphins’ love of music. Humans and cetaceans both have acute vision and hearing, but we are more visual and they are more acoustic. 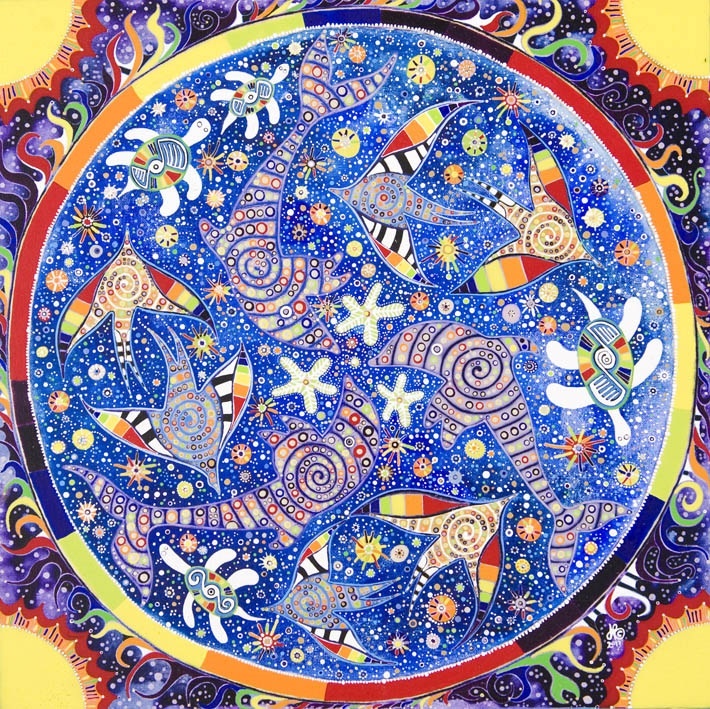 My belief is that they have deep and fundamental understandings of a “reality” that is far more expansive than ours; that they don’t need mathematics, geometry, calendars or symbols for this understanding; and that they are not imprisoned by the web of self-delusion so comprehensively woven by homo sapiens. Their advanced social relationships, and, in particular, the fact that they do not kill members of their own species, testify to an “intelligence” far beyond that which we claim as uniquely our own. In the lower left corner you see the “six-fingered hand of industrial civilization” and representations of what it is inflicting on the cetacean and oceanic communities: the land is covered with solid-state circuitry-looking structures; an “all-seeing” microwave tower transmits its lethal “wi-fi” and mobile-phone rays; factories and nuclear power plants belch out toxic by-products; an atomic explosion releases megatons of isotopes into the atmosphere, already irradiated by legions of military and commercial satellites. The six fingers of the homo-cosm could represent the major threats to the health of cetaceans: whaling/harpoons, which are the only publicized threats to whales but in reality affect whales in general least of all; pollution in the form of waste-products, run-off, and spills; toxicity due to presence/high concentrations of a host of chemicals, e.g., pesticides, discarded military ordnance, including chemical and biological weapons as well as radio-active waste; drift nets and trawlers; noise from any motorized boats or ships, as well as from seismic testing explosions; and low-frequency active sonar, or LFAS, which U.S. submarines use, allegedly “to detect silent submarines” but which really functions as an anti-whale weapon, as the extreme sound levels it generates, on the order of 160 db with “kill zones” the size of Texas, explode their inner-ears. 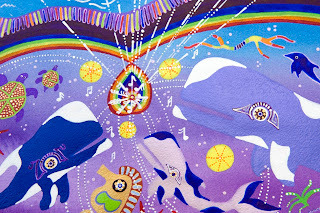 Ultimately, in this vision, the whales and all life in the ocean are protected by a full-spectrum rainbow continuum, which is generated through an interaction of cetacean sound artistry and emanations from the Hunab Ku (center of the galaxy) mediated by the sun and other stars near us. 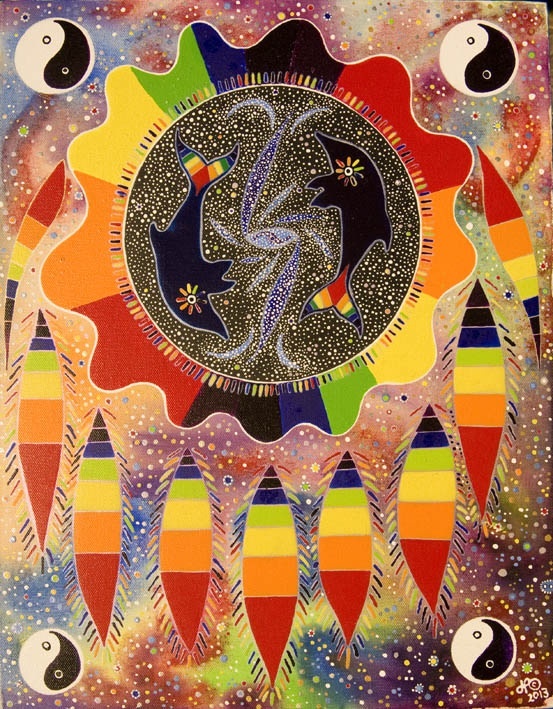 This is the fabled “rainbow bridge” prophesied in native American traditions. 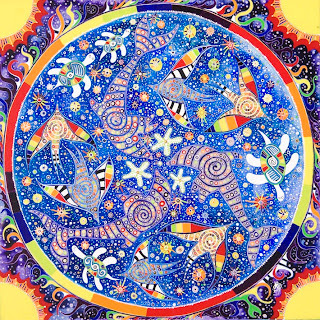 They are shown here “singing”…we don’t have words to describe what they do with sound…yet…but this is the closest approximation we have…they are “singing” vibrations of love and healing to everyone, on land, in the sea, and in the heavens…to help us all awaken from our lethal sleep-walking and to learn to use the “ultimate technology” which we are in ways that it’s meant to be used: for spiritual creativity. 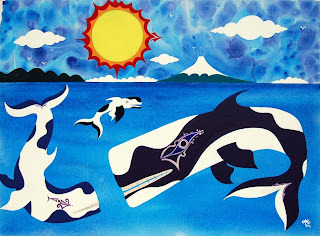 “Tutunui-wananga” is Maori for “the personification of the knowledge of whales” or may be better translated as “longest-standing knowledge” or “knowledge of the highest standing”; “Kali” is the Hindu deity of death and destruction, in the latter stages of whose yuga we are said to be now, as reckoned by some calendrical systems; and “koyaanisqatsi” is the Hopi word for “life out of balance”, the period of time they say we are now in, where everything runs amok and the Earth eventually “cleanses” herself of all that is not in harmony with life. 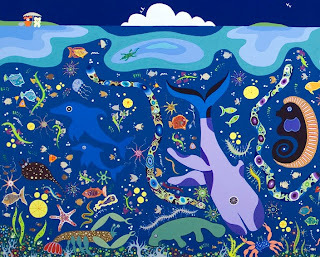 Paleontologists agree that the cetaceans have been around in pretty much their present forms for on the order of 30 million years; during this time they may have seen terrestrial life-forms come and go, as the land-based environment is more volatile and less stable than the oceanic. Life-forms on land are more highly bombarded by energies originating outside the Earth, and subject to mutation from these energies; water is very good at blocking these vibrations. Someday we might be able to see ourselves as they “see” us; if we exist long enough to achieve this level of conscious communion, the revelations it brings could be of far greater consequence than the highly-touted “contact with an extraterrestrial civilization” that pop-astronomers have long awaited. 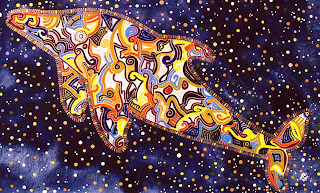 In fact, the cetaceans literally are an “extra-terrestrial”, i.e., “away from land”, intelligence…here and now on the same planet as us. I tend to think that really, we’re on their planet. The first and greatest step towards “communication” is awareness and acknowledgement of the problems that WE are creating for them, then STOPPING all these things so that they can live healthfully again, free from the effects of our aggression, greed, waste, and stupidity. 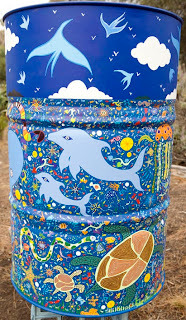 In honour of the on-going contributions of Dr. Roger Payne, who originally referred to humpback whale vocalizations as ‘songs’ and Iain Kerr, CEO of Ocean Alliance, who recently completed a global five-year survey of chemical contamination of the ocean, as well as two surveys of the Gulf of Mexico in the wake of the on-going BP oil debacle, I did this painting for them. The idea is to use this painting as the back-ground for a poster or chart of information about cetaceans, who they are as fellow beings as well as major threats to their well-being. A large canvas done for our fantastic friends in Kaiapoi, New Zealand. Only one person in the world owns more of our art than Mr. O. This one is a joint effort showing our Aotearoa influences but draws on Liesbet’s special way with form and colour. The first in a planned series of three panels. 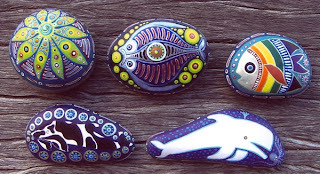 I’ve painted possibly thousands of rocks with cetaceans of various kinds on them, no two of them identical; here are a few very special ones. 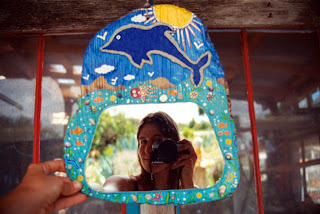 This is my main cetacean blog. Recent postings have tended to focus on what HAS to be the most urgent of any issues relating to the whales and dolphins, their blatant murder by military and industrial activities around the world. 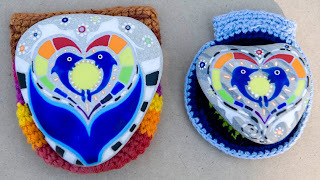 On this blog you can find numerous postings relating to whales and dolphins, for example, how ‘save the whales’ organizations aren’t as interested in ‘saving the whales’ as they are in being tv celebrities and getting your money. There’s also a posting about an on-going menace to sea-life in western Australia, a military-grade speed-boat doing ‘eco-tours’ at 90 km/hr in a shallow marine sanctuary that killed a human snorkeler yet continues to operate unregulated; this is just one glaring example of another global threat to cetaceans. The following postings concern Sea Shepherd's activities. The top one contains a brilliant statement by Rosalind Peterson. You can watch a short experimental film we made two years ago at the link below, it's footage of water shot in northern Australia with original music I did. Our 'beyond film' about the whales and dolphins will be more in this kind of direction, but more highly experimental and conceptual.